All of our Kindergarten-8th grade students participate in a visual arts class twice a week. Students study art history, famous artists, and various art styles. In Middle School students can choose from a variety of art electives such as photography or 3D Art. Beginning in 5th grade, our students are invited to join the band! All students are fitted for an instrument at the start of the year and have multiple opportunities to perform their new-found skills throughout the year. Our elementary students attend music class twice a week with a Christmas time performance. 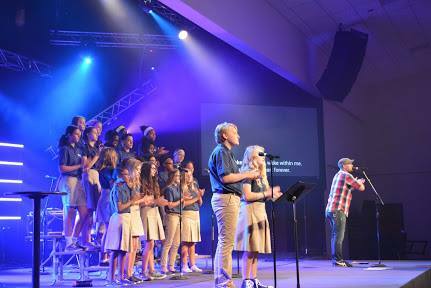 Middle School students can choose to join the choir with multiple performance opportunities throughout the year. Our 5th-8th grade students have the opportunity to participate in our extra-curricular spring play. There are tryouts, casting, costume fittings, performances, and a cast party to boot! We’ll be in touch shortly, thank you!